Barbara K. Jackson, a founding philanthropist of the Mondavi Center, passed away on September 7, 2018, only a few weeks short of her 100th birthday. 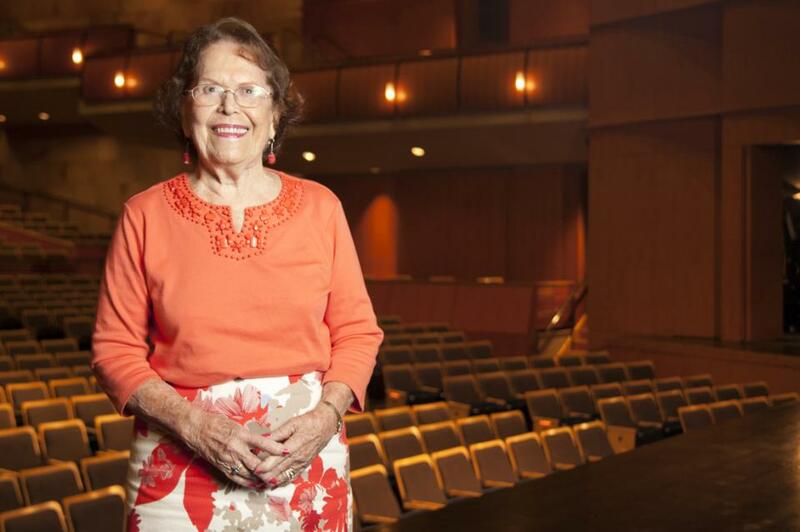 Along with Larry and Rosalie Vanderhoef and Robert and Margrit Mondavi, Barbara Jackson helped give life to the dream of a performing arts center on the UC Davis Campus – a dream first described by Chancellor Vanderhoef at his inaugural convocation. Her generous gift to name the Center’s largest performance space as Barbara K. and W. Turrentine Jackson Hall played a significant role in launching this great performing arts center. In addition, Barbara’s philanthropy reached out to support other disciplines at UC Davis (the Music and History Departments); other arts organizations in Sacramento; and young opera artists through the Adler and Merola programs at the San Francisco Opera. To honor her legacy, we are dedicating the annual Barbara K. Jackson Rising Stars of Opera concert to a celebration of Barbara’s life in music. That concert, on October 4 at 8 p.m. in Jackson Hall, takes place on the centennial of Barbara’s birth. Seven past and current Adler Fellows, whose participation in this program Barbara sponsored, are coming from around the nation to sing in her honor. They will be singing arias and duets from many of the greatest opera composers, accompanied by pianist Mark Morash of the San Francisco Opera Center on the first half, and by the UC Davis Symphony Orchestra, conducted by Professor Christian Baldini on the second half. We believe that there could no better way to memorialize Barbara’s life and good works than with the beautiful music and the wonderful singers she loved so much. Barbara’s generous sponsorship has allowed our Rising Stars concert to be free to the public. Tickets to attend are available at mondaviarts.org or by calling 530‐754‐2787. Until October 4, we can remember Barbara and her legacy every evening as the Mondavi Center’s south wall is lit in purple, a color all of us who knew Barbara associated with her. These beautiful lights keep us mindful of someone who indeed lived a beautiful life of generosity and music.